Whenever you click on a song, album or artist, you can instantly receive a playlist of similar singers and songs from your collection by clicking the blue triangle and “Create Smart Playlist.” Don’t like some of the songs there? On your phone, simply swipe left on the title and it’s gone, baby, gone. You can now shuffle all the songs in your listening “Q.” On the website dashboard, click the Q on the lower-right corner of your screen and select “Shuffle” at the top of the song list. On the mobile app, go to the Q then tap the shuffle icon on the lower-left corner of your mobile screen. Instantly see all the ridiculous things Redfoo and Rihanna are singing with our Lyrics feature (photo above). 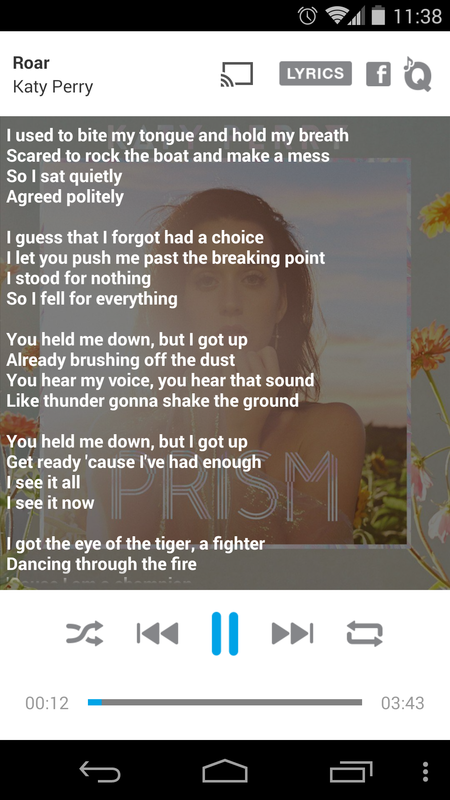 The Lyrics button is located at the top of the screen for the song you’re listening to. You can also import your music from Dropbox and Google, and play your collection on most Samsung smart TVs and Samsung Neo & Gear smart watches. For more tips and step-by-step instructions, visit our Help & How-To section at the right.